Jane Lynch, Ryan Reynolds and Mandy Moore are among the Hollywood stars donating to presidential hopeful Pete Buttigieg. 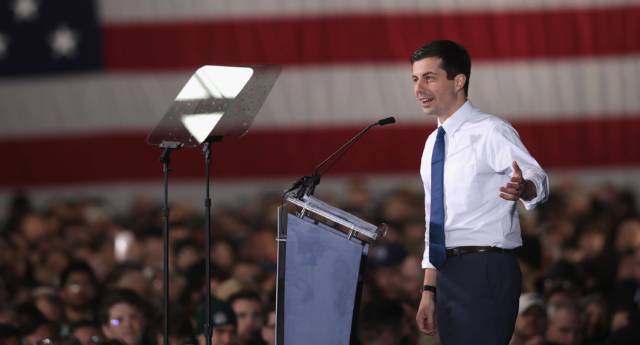 The gay mayor of South Bend, Indiana, made history on Sunday (April 14) when he launched his 2020 campaign for President of the United States. According to Variety, filings with the Federal Election Commission reveal the mayor has won some high-profile backers to date. Hollywood stars including Deadpool star Ryan Reynolds, Glee‘s Jane Lynch, West Wing‘s Bradley Whitford and Mandy Moore of This is Us are among those to have made donations to Buttigieg. The Indiana Democrat has fared well in fundraising so far, raising $7 million towards his presidential bid, putting him within reach of several of the favourites in the race. The candidate has not shied away from addressing his relationship with husband Chasten, sharing a tender moment with him onstage after announcing his bid in South Bend on Sunday.